2013’s observing sessions came to a premature end for two reasons – firstly I landed a short-term work contract (four months) which meant I had to be up at 0520 in the morning so that, and not getting home until 6 PM, meant astronomy got binned off because I didn’t feel like doing any! Secondly, the weather during autumn and winter was even worse than ever with near constant rain and storms. Likewise, 2014 has got off to a slow start because of the weather (we had three hurricane-force storms in ONE WEEK during February!). 29th March was the first evening of OzSky 2014 and it looked less than promising at first with thick clouds and only tantalising glimpses of an almost-overhead Sirius and some of Orion’s southern stars poking through. Nobody was too bothered because we’d all left Sydney at 0720 that morning, with a 7 hour train ride to Dubbo and a further two-hour drive to Coonabarabran on top of that, so everyone was in bed early hoping for some good observing later in the week. However, there was a knock on the door just after 0130 AM to say the skies were open and so were the telescopes, and it didn’t take long to get up and get ready as all of us Northern Hemisphere dwellers were eager to get outside and see the southern sky in all its splendid glory. This was a casual session, just looking at the eye candy, as most people were still tired after a long day and only a few hours sleep (and, in my case, only a few hours sleep the previous night as well, because I never can sleep when I have to get up early). I decided that a personal rule for this week was to observe only those objects with a negative declination, and preferably nothing north of -30. I don’t think there is any point travelling 12000 miles to observe things I can easily see from home, because it’d be a waste of observing time. Theoretically we can see to -40 from my home latitude of 50 North but, in practice, this is not possible due to atmospheric extinction and general crud. 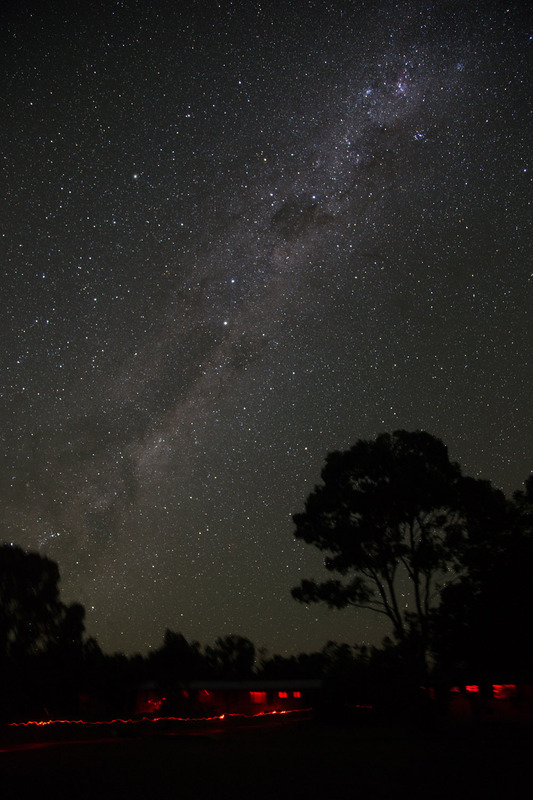 Even Sagittarius and Scorpius, the southern portions of which can’t be seen from even the southern UK, I have seen from more southerly latitudes, such as the Texas Star Party and during my first observing trip to Australia in July and August 1997. One of the first objects I observed was the ‘Homunculus‘ in Carina. This is material being ejected by the supergiant star Eta Carina and, visually, has a distinctly yellow/orange appearance. It’s one of the few objects which, to a visual observer, actually looks like its Hubble photo. It’s also the only object I sketched during the week, simply because I wanted to get through as many objects as possible which sketching – properly sketching and making a decent job of it – does not allow. Instead, I wrote down as many observations as possible. I wished I could have sketched more objects but that’s for next time. The entire Eta Carina Nebula is a vast, sprawling complex with a dark lane bisecting it as well as other dark areas, such as the Key Hole. Open star clusters also reside within the nebula. The nebula almost completely fills the field of view of my 8×42 binoculars and has a greenish tinge to it, which is more apparent with a telescope, such as one of the 25″ dobsonians. NGC 4755, the Jewel Box in Crux – I’m not a big fan of open clusters but this is a beauty in any telescope and binoculars and a favourite from previous visits south of the Equator. Located near Beta Crucis, telescopically (14″) it forms a capital A shape with white stars forming the outside of the A and two blue stars and a red giant forming the bar of the A. There are also fainter stars dotted in and around the main part of the cluster. The shape is apparent in binoculars although colour can’t be seen in my 8x42s. It’s also visible to the unaided eye as a bright spot immediately south-west of Beta Crucis. NGC 104, a.k.a. 47 Tucanae, globular cluster in Tucana. Located right next to the Small Magellanic Cloud, this can be seen with the unaided eye as a spot next to the galaxy. With 8×42 binoculars it’s obviously a globular cluster, with a fainter outer envelope surrounding a bright core. Not resolved in the 8x42s. I used an 18″ Obsession dob for my telescope observation of this. It shows the bright, small, very dense core well in the scope. The cluster is symmetrical, unlike other southern showpiece Omega Centauri, and is almost totally resolved. The core stars are golden yellow. Of course I observed both this and Omega Cen., and I’ve got to admit I like 47 Tuc the better of the two. NGC 5139, globular cluster in Centaurus. Of course this is Omega Centauri, an object which I’ve observed on a number of occasions when I have been far enough south to see it (including four trips to TSP, three trips to Australia including this one, and two trips to Ecuador). We don’t miss it by much from the south coast of England, as it lurks tantalisingly a mere seven degrees below the horizon for us. Huge and bright, even brightness with no concentration towards the centre. Totally resolved and has a three dimensional appearance in a large telescope. The ‘Footprint Feature’ near the core was obvious. Showpiece. Large Magellanic Cloud, galaxy in Dorado – spectacular through 8×42 binoculars with many knots and patches visible. Prominent among these is NGC 2070, the brightest patch located in the NW end of the galaxy. Another bright area was NGC 1769/3 which is visible as a bright detached knot. Packed up as it was getting light. Telescope: 18″ f/4.5 Obsession Dobsonian with Argo Navis DSCs. Eyepieces: 26mm and 12mm TeleVue Naglers. Conditions: Clear, seeing good, transparency average. Warm to cool later in the night, around 60C. NGC 2808, globular cluster in Carina – This has a very dense compact core. It is mostly resolved with the 26mm and I can see stars right across the face. With the 12mm, the cluster is completely resolved and is perfectly round. I spent some time, this first serious session, in the Large Magellanic Cloud because this was a particular observing target of mine for this trip. It’s such a rich area that I got a bit confused, even with the Argo Navis system. I think my identifications are correct, but I need to double-check when I get home. I had a chart with me, downloaded from the internet, but it was only prepared for 15×70 binoculars and, as such, was wholly inadequate for an 18″ telescope! Even the Aussies get lost and confused in the LMC, as they told me! That said, I have not done this area any justice whatsoever, despite my best intentions. I am planning to return next year or in 2016 so I will do more then. NGC 2070, a.k.a. the Tarantula Nebula in Dorado (in the LMC) – this is so bright and detailed it’s hard to describe. Loops of nebulosity and dark areas surround a central bright area where there is a cluster of 9 or 10 bright stars. At higher power (12mm) the nebula looks like an angry alien face, at low power it looks more like an angry lap-dog (a Chihuahua). No written description short of a complete essay can do this justice and I had to move on. Tried a sketch but gave up. That will have to wait until next time when I have more time to do one. NGC 2074, open cluster in Dorado (LMC) – Adjacent to 2070, this is small, bright, compact and is irregular in shape. It’s mostly resolved with the 26mm eyepiece although it has a nebulous background. With the 12mm, averted vision shows the cluster as much brighter and mostly resolved. The stars are all of varying brightnesses and and all are the same colour (white). NGC 4372, globular cluster in Musca – A large and loose globular with no condensation whatsoever towards the centre. It’s partially resolved in the 26mm, with stars scattered across a nebulous background. With 12mm, it’s still not completely resolved although more stars are visible. A bright star lies to the west. NGC 4833, globular cluster in Musca – A nice bright globular, similar to 4372 but brighter. This has a slight concentration of stars towards the core and one side of the cluster is dimmer than the other (dust?). It’s very nice indeed with the 12mm Nagler. NGC 5189, planetary nebula in Musca – I also observed this object during my trip to Australia in 1997. It’s an odd PNe which looks like a barred spiral galaxy. NGC 5253, galaxy in Centaurus – Theoretically visible from the UK and included in the Herschel 2500 list of objects. I have tried for this from home, with a southern horizon over the English Channel, but haze came up, obscuring the view, and I saw nothing. From here however, being right overhead, this is a bright galaxy, almost edge on with a brighter core. The 12mm provides a nice view. The galaxy is elongated north-south with a bright non-stellar core. 26mm and 12mm Naglers. NGC 4945, galaxy in Centaurus – This is fabulous. It’s an edge-on galaxy with a faint core and fairly uniformly bright. It’s very large, stretching across the filed of view of the 26mm Nagler. It lies in a rich area and is probably obscured by dust. Telescope: 18″ f/4.5 Obsession Dobsonian with Argo Navis DSCs. Eyepieces: 31mm, 26mm and 9mm TeleVue Naglers. NGC 1515, galaxy in Dorado – A very nice edge-on spiral elongated north-south. With the 26mm it looks fairly uniform, except for a hint of mottling. With the 9mm the edges look diffuse. There is a tiny stellar core and more of a hint of mottling. NGC 1549, galaxy in Dorado – Another very nice almost edge-on spiral with arms visible at low power. It condenses to a bright non-stellar core. There is a star lying just off the eastern side. With the 9mm, the spiral arms are very obvious and there are some font foreground stars superimposed across the face of the galaxy. The core is bright but doesn’t appear stellar. 26mm and 9mm Naglers. NGC 1313, barred spiral galaxy in Reticulum – Bright despite its low altitude. Elongated north-south. With the 9mm Nagler, the arms are obvious (not so obvious at low power). The arm on the northern end points east while the arm on the southern end points west. A fab object. A star lies just off to the north. NGC 1792, galaxy in Columba – Mottled with a bright core. Elongated 4:1 (need to check orientation). With the 9mm it has a very bright core with a non-Stella nucleus. 26mm and 9mm Naglers. NGC 1851, globular cluster in Columba – This is a very nice bright large globular with a very small, very dense bright core. With the 26mm it’s well resolved with the outer stars totally resolved. With the 9mm it fills a quarter of the field of view and is almost totally resolved. A fabulous object. NGC 1553, galaxy in Dorado – Very small and bright. Round, with a very bright core. It forms the head of a cross, with four stars. Lies north of NGC 1549. With the 9mm Nagler a large diffuse halo surrounds a bright compact non-stellar core. NGC 1581, galaxy in Dorado – Bright, elongated north to south. Bright core. With 9mm brightens to the centre and a bright compact core. Star on west side. Just east is a large very faint galaxy elongated east to west. Uniformly bright. Need to check this with NSOG vol 3 when I get home. R Leporis, a.k.a. Hind’s Crimson Star – gorgeous deep red star. NGC 1672, galaxy in Dorado – easily found with a 31mm Nagler. In the 9mm it appears elongated east-west with a faint diffuse halo surrounding a bright compact core. A spiral arm obvious. Barred spiral? NGC 1763, globular cluster in Dorado – This is adjacent to the LMC and is small and bright. Not resolved with the 26mm. With the 9mm it’s slightly resolved, but mostly granular. Uniform brightness, no condensation towards the core. NGC 1769, nebula in Dorado – with the 26mm this is bright but small. In the 9mm it appears irregular and there are stars involved. NGC 1715/33 bright nebulosity in Dorado (LMC) – There are three main areas of nebulosity with one large irregular patch to the west and a smaller round patch to the east, with a small round area around a star to the north. With the 9mm the largest area looks kidney-shaped with a dark area jutting in from the eastern side. There is an open cluster involved. The second largest is NGC 1733, according to the identification feature on the Argo Navis. It’s bright and irregular with a dark area on the western side. There are four stars involved with this one. The smallest area is fainter than the other areas. Two stars are embedded in it. There is also some very faint nebulosity lying nearby. Also used a ‘binocular chair’, an car battery-operated dentist chair with 25×150 giant Fujinon binoculars attached. They kept dewing up, but I still had fab views of the Coal Sack area, the Milky Way through Crux and Carina, including the Eta Carina Nebula, and the ‘Dark Doodad’, which is a dark nebula in the southern Milky Way. Also did some wide field astro photography with my Canon 6D, 24-105mm lens and an iOptron star tracker borrowed from Aussie astronomer Andrew Murrell. Here’s one of the pictures I took. Telescope: 18″ f/4.5 Obsession Dobsonian with Argo Navis DSCs. Eyepieces: 17mm Ethos and Paracorr. Conditions: Clear, seeing good, transparency average. Warm to cool later in the night, around 60C. Some drifting cloud from time to time. This wasn’t my best ever observing session, due to tiredness, hip and knee trouble and ‘hitting the wall’ at around 0130. NGC 1316, a.k.a. Fornax A, galaxy in Fornax – Fairly large and bright with oval diffuse edges and a bright compact core. NGC 1300, galaxy on Fornax/Eridanus border – Low and faint due to altitude. Uniform brightness. NGC 1365, galaxy in Fornax – A showpiece. Z-shaped barred spiral with a bright core. Aligned east to west. Fabulous. NGC 2442, galaxy in Volans – A barred spiral shaped like the letter ‘S’. It has a compact stellar core. A nice object. See observation later on, from 4th April, made using a 25″ scope. NGC 1383, galaxy in Fornax – Elongated north-south. Bright. A diffuse halo surrounds a bright compact core. There is a star on the western edge. IC 335, galaxy in Fornax – Bright and very edge-on. Brightens a little towards the core and has a diffuse halo. NGC 1404 and 1399, galaxies in Fornax – this lie in the same field of view. NGC 1399 – Face on with diffuse halo surrounding a round bright, compact core, which is stellar. Is there a detached piece of core or is it a dark lane? NGC 1404 – Round, with a diffuse halo and a bright core. Obviously spiral. Star on eastern side. NGC 1427, galaxy in Fornax – Faint, round with a brighter centre. NGC 4650A, galaxy in Centaurus – Not spectacular but interesting and a nice object. There are two cores, one at 90 deg to the other in a diffuse round halo. NGC 2090, galaxy in Columba – Bright, oval galaxy which brightens to the core. Mottled? There is a bright spot at one end of the core. NGC 104, globular cluster in Tucana – very bright and large, filling over half the field of view of the 31mm Nagler. The gc is very symmetrical and totally resolved in the 30″. It has a very bright small dense core. There is a dark area right next to the core. 31mm Nagler. Fabulous! Nearby faint object located between two stars. Faint, diffuse with uniform brightness. With the 17mm Ethos there is some granulation and stellarings, especially with averted vision. NGC 362, globular cluster in Tucana – Small, bright with condensation towards the core. NGC 419, globular cluster in the Small Magellanic Cloud – Small and quite faint. Some concentration in the centre but not resolved with the 31mm. With the 17mm it shows some concentration towards the centre. Somewhat resolved but mostly granular, especially with direct vision. 31mm, 17mm. Lindsay 48, open cluster in Small Magellanic Cloud – A large o.c. Round, with extension to the west. Rich with many faint stars. IC 418, planetary nebula in Lepus, the ‘Spirograph’ – bright, oval ring. NGC 2818, open cluster with planetary nebula in Pyxis – the planetary nebula is a physical member of the open cluster. The PNe is irregular, bi-lobed with fuzzy edges. The open cluster is loose, not rich. 17mm Ethos. NGC 5286, globular cluster in Centaurus – with the 31mm eyepiece, this is a nice bright g.c. adjacent to a bright star on eastern edge. It condenses gradually to the core which is dense. Mostly resolved. The core looks slightly offset to the east. I did some binocular observations before returning to the 30″. My binoculars are 8×42 Leica Trinovid BNs. NGC 104 – Bright with bright core and fainter halo. Not resolved but granular. Small Magellanic Cloud – Easily visible to the naked eye as a detached ‘thumbprint’. Through the 8x42s it’s pear-shaped and not uniformly bright with knots and patches visible. NGC 2070 – Very bright and round with a brighter middle. Not visible to unaided eye. NGC 2516, the Southern Beehive – A very large open cluster, easily seen with the naked eye. Several bright stars are seen with binoculars. Large and loose, not rich. NGC 4835, galaxy in Centaurus – uniformly bright. Observation interfered with by clouds. NGC 6362, globular cluster in Ara – A very nice large and bright globular cluster. Fills a sixth of the field with the 31mm Nagler. Partly resolved with stars on a misty background. No condensation towards the core, which is not concentrated. There is a line of stars across the cluster. 31mm Nagler. NGC 6584, globular cluster in Telescopium – Another nice southern globular this is partly resolved in the 31mm with only slight concentration towards the core. With the 17mm, it still isn’t fully resolved. Fairly evenly bright with only slight concentration to the centre. NGC 6284, globular cluster in Ophiuchus – Small and bright. Not fully resolved but granular with a misty background, although some stars can be seen. Brightens towards the centre and has a small bright core. NGC 6652, globular cluster in Sagittarius – Oval, with a bright centre and a small bright core. Well resolved although still has a nebulous background. 17mm. The following night, over 3rd/4th April was a total cloud out while April 4th was clear only for a short while. A short session consisting mainly of eye candy, because of a cloudy evening not clearing til later, and then an early start the next morning to return to Sydney. Fog came in after 90 minutes and the transparency went. Large Magellanic Cloud – the best view of this all week, as the transparency was good until the fog arrived. With the unaided eye, it was easy to see extensions as well as the main body of the object. With binoculars (8×42) extensions could be seen to the W, NW and SE, with a fainter area lying to the E. A large X-shaped detached area is very obvious to the W and NGC 2070, in the NW, was easily seen with the binos as a very bright irregular patch. Brighter areas and spots litter the galaxy throughout. Circinus galaxy (ESO 97-G13) – this is mostly obscured by the Southern Milky Way. The bright core is obvious, but that’s pretty much it. In a very rich location, with many foreground stars. 25″ with 17mm Ethos eyepiece. Shapley 1, planetary nebula in Norma. Obvious in 18″ Obsession dob, with 26mm eyepiece. With 12mm Nagler it looks almost perfectly round, with one side of the ring brighter than the other. Central star obvious without the OIII filter. The OIII filter brings out the nebula but dims the central star considerably, although it is still reasonably easy to spot. NGC 2442 – a fabulous barred spiral galaxy. The bar is bright although the arms are of lower surface brightness. Elongated NE-SW. An arm comes off the NE end and bends towards the NW. At the SW end, another arm extends to the SE. 25″ SDM dob. 17mm Ethos. Also had the best view of Mars ever after the fog came up (the transparency had gone but the seeing was fabulous). It was salmon pink, with polar cap on display and Syrtis Major was as easy to see as I’ve ever seen it. Not only that it showed some detail, with a mottled appearance. This was with the SDM 25″ and 17mm Ethos. NGC 5128, galaxy in Centaurus – Centaurus A. Huge and bright, seen easily in binoculars and as a faint fuzzy spot with the unaided eye. Telescopically, at any aperture, it is bisected by a dark lane running across it and detail can be seen in the dark lane. I’ve observed this many times when I have been far enough south to do so so didn’t spend much time on it. That was it for OzSky 2014.